If you’re looking to hire a choir, look no further! Comprised of professional singers cherry-picked from all over the North of England, the High Row Choir not only offers exceptional singing quality but also a vast repertoire of sacred and secular choral music by composers from the Renaissance to modern era including Whitacre, Rutter, Tallis, Mozart as well as the choral music chosen at the recent wedding of the Duke and Duchess of Cambridge. 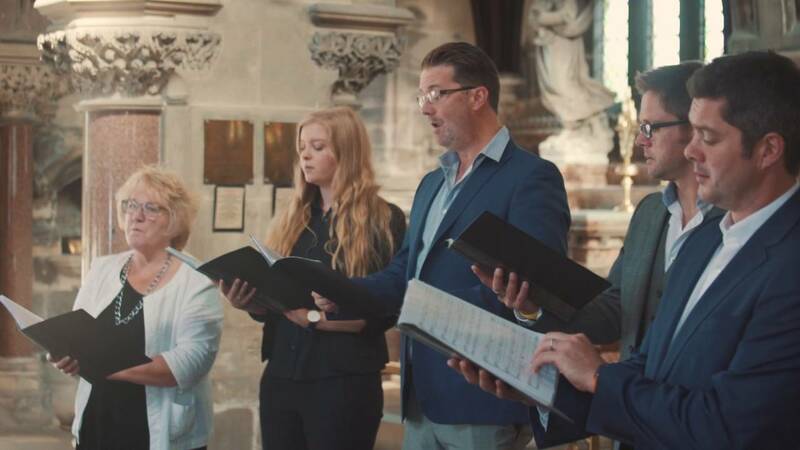 The High Row Choir has been known to move listeners to tears with its beautiful, ethereal sound. The perfect choice for a traditional church or cathedral wedding. The High Row Choir is also very experienced at performing at funerals. These are only a few of the pieces we love to sing at weddings. (Please note that many of these pieces will require an accompanist which will incur an additional fee). If you want choral versions of modern songs or have specific requests not on the list please ask. From £600 for a wedding ceremony, 4 singers Soprano, Alto, Tenor and Bass. Please ask for special concerts and other types of performance. The High Row Choir comes in many shapes and sizes but generally consists of soprano, counter-tenor, tenor and bass. Small churches and hotel weddings will generally need 1 per part, so a 4 person choir, whereas larger churches and cathedral’s will require 2 per part, so an 8 person choir. The High Row Choir can also provide choral soloists where required. Thank you so much for providing the music for our day, it was honestly spectacular & we couldn’t have asked for anything more perfect! I had goose pimples all over for “This Marriage” & I know that it was the same for many others too, so many people commented on how fabulous the choir sounded. Strings attached were then just fabulous for the drinks reception & everyone thoroughly enjoyed themselves during their performance, it certainly got the part started. We feel the music choices & style were just perfect for our day & made it extra special for us. The songs & arrangements were perfect & acoustics in the lodge were stunning. Thank you so much for all your effort &help, it was really a pleasure having you help us with this for our day. We are recovering from a marvellous wedding weekend and on our way to Tuscany for a week’s break but really just wanted to add our many thanks for gathering those wonderful voices together and making the marriage service for Andy & Georgina extra special. We have already received many messages of gratitude for the moving marriage service and splendid singing so we are grateful for your time , efforts and the talented choir. We’re currently in Munich having been diverted (we’re supposed to be in Venice!) so I’ll use the opportunity to reiterate what Mum has said – we were absolutely bowled over by the choir and organist. They were all incredible, and you were right – having the choir sing during the procession was so very special. I can tell you that we couldn’t have been more thrilled with the choir and the soloist was perfect..what a moving performance. My only regret was that the signing didn’t take longer to give us the opportunity to hear the 3rd piece!